NO..not the red light..DAMMIT! OK so...totally my fault, my camera ran out of battery (I forgot to charge it) and it made that dreaded beeping noise EURGH!!! Yeah, you guessed it, I do not like beeping noises, and this beeping noise in particular meant that I had to shoot this look on my iPhone, which will do but the quality isn't great, so sorry Dolls! Don't you just love that feeling you get when you find a really great outfit and you're like TOTAL LOVE! Yeah. That's how I feel about this one.. after tearing my wardrobe apart trying to filter through my already worn clothes, I couldn't help but feel completely hopeless! WHAT TO WEAR!?! "Women who wear black, lead colourful lives"
This is the first time I have worn my Chanel pearls and oh how I love them. They are beyond beautiful, dazzling in fact and yet I haven't found an outfit with which I can pair them with...Until now! Chanel pearls are classic and timeless and every Chanel woman wants them. However, I don't want to look middle-aged when I am 21 as they are quite the statement for a young woman, therefore they have been guarded in their box with it's bow wrapped tight eagerly awaiting to be worn. As I pieced together this rock-chic look, all black everything, I thought to myself 'something, just something is missing to just accentuate, compliment and break up the black...' Then it all fell into place, and VOILA! 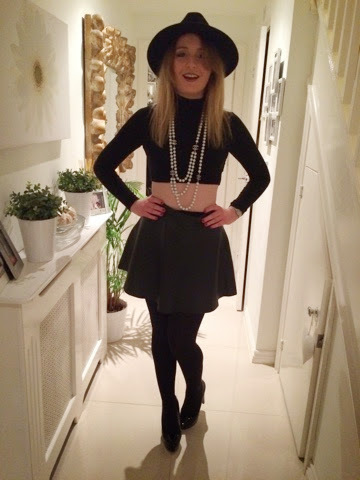 This outfit was perfect for Daniella and Ben's bday bash! Happy Birthday Dolls! Thank you for a wonderful evening!